The caste system in Yezidi culture is very carefully followed and guarded by a long list of rules about intermarriage, societal roles, and even day to day interactions. There are lots and lots of layers between the caste system and class system. Basically, there are three castes — Murids, Pirs, and Sheiks. Most Yezidi belong to the Murid class and are just common people without special roles. The sheik caste is divided into three group which produce the three leaders of the community. None of these groups, or tribes, are permitted to intermarry with each other in order to maintain the purity of the lines and prevent political murkiness. Generally, this caste is responsible for the spiritual well-being of the community. One tribe produces the Prince (mir). He is the political/social leader of the community. The position of Prince is hereditary. His main role is to be the representative of the Yezidi people to the surrounding communities and to help settle inter-tribal disputes. There are some religious events that can’t be started or considered properly celebrated without the Prince. The second tribe produces the Baba Sheik who is the spiritual leader of the Yezidi. This man has to come from a specific family and the title is passed from father to son. However, a new Baba Sheik has to be nominated by the Prince. This is more of formality to show the unity of the Yezidi leadership. As the spiritual leader, the life of the Baba Sheik is fairly austere — he never consumes alcohol and fasts for at least 80 days a year. He and his family and primarily supported by the donations given at feast days or during the annual visits. This is supposed to keep the Baba Sheik connected with the common people. The third leader is the Pesh Imam. His tribe is slightly separated from the rest of the community as they tend to be more closely tied with Islamic traditions than Yezidi traditions. The Pesh Imam sets the bride price and presides over marriage ceremonies. He accompanies the Baba Shiek on all of his travels. Unlike the Prince and Baba Shiek, the Pesh Imam is not a hereditary role. He is appointed to his position by the Prince. Traditionally, the tribe of the Pesh Imam were the only tribe that was permitted to learn to read or write. This has changed in the last 20 or so years with education becoming a government mandate. Still, this tribe tends to be the most well educated. Pirs are the clerical counterpart to the Sheiks. They are religious leadership, with less of the political clout of the Sheik caste. Most pirs perform the regular religious customs such as marriage and baptism ceremonies. They also maintain the various shrines and holy places and give out blessings. The pirs tend to be more withdrawn from the community and are often seen as mystics. They have even been attributed the power to heal in some traditions. Rules of interaction between castes are further complicated by a co-existing class system. In the murid caste, there isn’t a system of class. Anyone of that caste is free to marry whoever they choose from their own caste. However, they are expected to have a “brother of the hereafter” from each of the other castes. These “brothers” not only teach and guide them but are also (in part at least) dependent on them for offerings of money and food. The other Yezidi castes may also only marry within their own caste, however, their marriages are also dictated by class. There are strict expectations of how these classes interact with each other on a day to day basis. Each class even has its own mode of dress to distinguish it. So, let’s get into it! The easiest class to explain are the kocheks. This is a subgroup that crosses all caste lines. Anyone with the gift of clairvoyance can be a kochek, even women (they’re called faqras). These are the people who have visions of souls that have departed. That is not their only gift, however. They can prophesy, speak in tongues, and heal mysterious ailments. Although anyone can be a kochek, most of them come from the murid class. Faqir is another class that is marginally open to anyone. However, most faqirs tend to come from four specific tribes. Faqirs are the ascetics of the Yezidi. They are not permitted to trim their mustaches or to consume alcohol. They are required to set a good example of holiness to the Yezidi by fasting and remaining abstinent. To become a faqir is a choice, not an inherited position. No one can be born an ascetic. One of the roles of those of this group is to maintain the sacred cloths and writings of Sheik Adi. 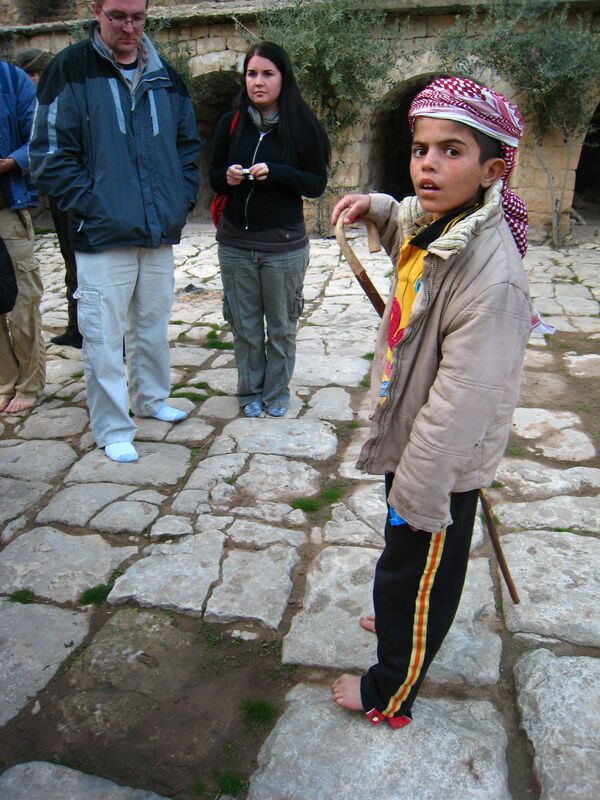 They are also the only people permitted to dress just as the Sheik did — a black wool tunic and a red braided rope belt. The third class comes directly from the pir caste only, and are limited to two tribes within that caste. This class is again a matter of choice, but one that must be made when a boy is quite young. Qewels are raised with strict religious instruction from their youth, generally taught to them by their father. Their name roughly translated means “knowledge at heart”. They also learn the sacred instruments — the tambourine, tambour (a thin, flat drum), and the flute. Their job is to travel from village to village to share the sacred songs of the Yezidi. Half minstrel half itinerate preacher, they are a key part in keeping the Yezidi together as a people. 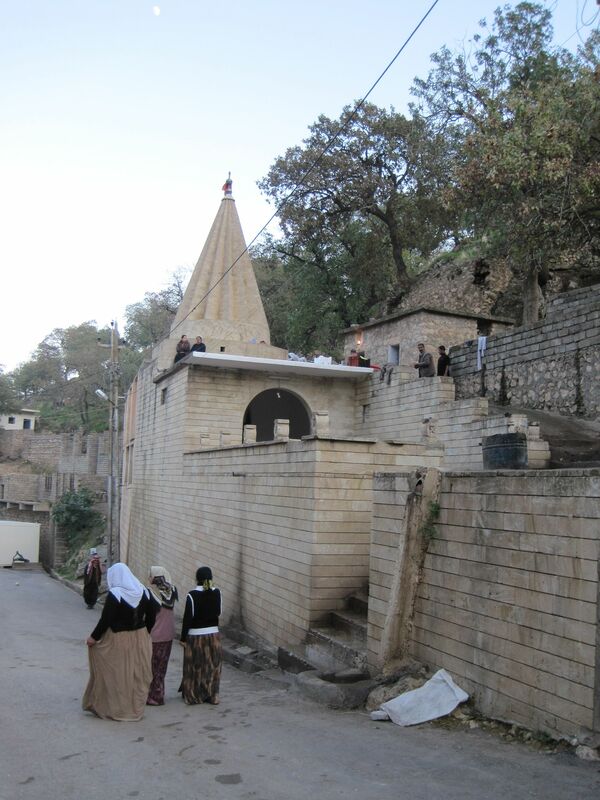 No Yezidi holiday, rite, or ritual can be celebrated without them. If you have been faithfully following along with this series, and have even a small amount of knowledge of other religions, you have probably picked up on some similarities of belief. There are definitely commonalities with Islam, Christianity, and Judaism. They even share at least one holiday with their Muslim neighbors. Yezidis would consider themselves as running parallel to those larger religions. They are not opposed to other people having other beliefs as long as those others don’t try to mix with them. Do they really ban cabbage? Because of the separateness and secretive nature of their religion they are frequently misunderstood and persecuted. In fact, they keep a record of times of major persecution. There is a very commonly held belief that Yezidi are devil worshippers. In fact, that is probably the only thing that most of their neighbors “know” about them. Because of this misconception (and perhaps for other reasons) Yezidis have been very careful not to speak the name of Sheitan (or Satan). They go so far as to prohibit speaking words that sound like Sheitan. This include the words for blue and cabbage. This restriction has in turn led to the belief (perhaps even among themselves) that it is forbidden for them to wear the color blue or to eat cabbage. There is also a certain amount of ignorance among the Yezidi about the wider world. Their closed society and disinclination to get more than a minimum education has really caused them to be left behind by the fast forward moving world. There is some belief among them that this ignorance may be making it harder for those who have been captured by ISIS to escape. Because of this, they are beginning to see and value education for all of their people, not just select castes. And now for the elephant in the room. No one wants to become well know for the atrocities that have been perpetrated against them. However, that is how the Yezidi have come into the spotlight. ISIS invaded their towns and villages, slaughtering and imprisoning them, primarily on the assumption that they are devil worshippers. Though many of them have been rescued, released, or have escaped there are an estimated 1,500 still enslaved. The lives of those who managed to escape have not been untouched. Many of them are entering their third year in refugee camps (2017). A few have begun to return home to find their villages booby trapped or completely destroyed. Their way of life, society, and beliefs are in risk of disappearing forever. At the very least, they will be greatly changed. The next part on Yezidi Mythology is HERE! Read the introduction to this series here! Then Part 1 and Part 2! Help support the refugees in Northern Iraq, many of whom are Yezidi.